Carluccio’s has launched its new summer menu celebrating the very best of regional Italian ingredients from Antonio Carluccio’s homeland. Diners are being given the chance to taste the menu with selected dishes on offer at half price during the first few weeks of the new menu’s launch until the 7th June*. Created by Antonio and his team of chefs, the plates champion flavours from across the country, from Puglia and the Amalfi coast, to Tuscany and Veneto. From light starters and mains to feature dishes, the new menu embraces the simple joys of great Italian cooking. At the heart of each dish authentic Italian ingredients are prepared simply and shown at their best. No Carluccio’s menu would be complete without pasta, now featuring three delicious new dishes, including spinach and ricotta ravioli using an original recipe from Antonio’s first restaurant on Covent Garden’s Neal Street. Spaghetti vongole – a creation commonly found in Italian coastal villages, most famously in the laguna of Venice – sees the pasta gently cooked with white wine, garlic, chilli and fresh clams. Festoni pasta with smoked salmon, crushed tomato, vodka and cream sauce, takes inspiration from famous Italian car designer Giorgetto Giugiaro who cooked his recipe for Antonio in the mid-1980s. On the move? 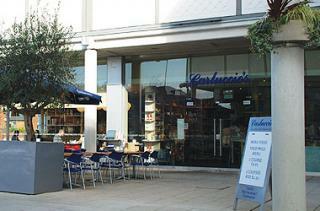 Carluccio’s in-house deli and foodshop features a range of summer dishes – ideal for busy lunch breaks or snacks to go. Discover piled high ciabatta sandwiches, freshly made pasta dishes and vibrant salads as well as beautifully finished tarts and cakes. If the sun’s shining order a Classic or Vegetarian Carluccio’s picnic featuring an antipasti selection, delicious salads and sweet treats to be enjoyed al fresco – there’s even a Children’s picnic to keep the little ones happy*! A vast array of Italian products that taste as good as they look are perfect for creating an Italian feast at home. To accompany the new range of dishes, the drinks menu has also been refreshed, offering a carefully curated selection of cocktails that will transport you to the pavement cafés of Italy. Try the Disaronno Marmalade Sour made with Carluccio’s clementine marmalade, lemon and fresh orange spiked with amaretto or opt for a refreshing Malfy Cooler, with Malfy Italian gin, elderflower, Martini Rosso and ginger beer. Head to Carluccio’s to celebrate the simple joys of an Italian summer.